Texas-based SoundSport teams, Bayou City Blues and Horizon, brought more than just entertainment to fans at the Alamodome on Saturday, July 23 during the DCI Southwestern Championship presented by Fred J. Miller Inc. Members of both teams expressed their passion for marching music and creativity on the field. First to take the stage was Bayou City Blues, once an All-Age corps that has reorganized as a SoundSport team following a number of years of inactivity as an organization. The group earned a silver rating after performing its production “Launch.” The title originates from the corps’ relaunch this year in addition to its home city, Houston, where the Johnson Space Center is located. 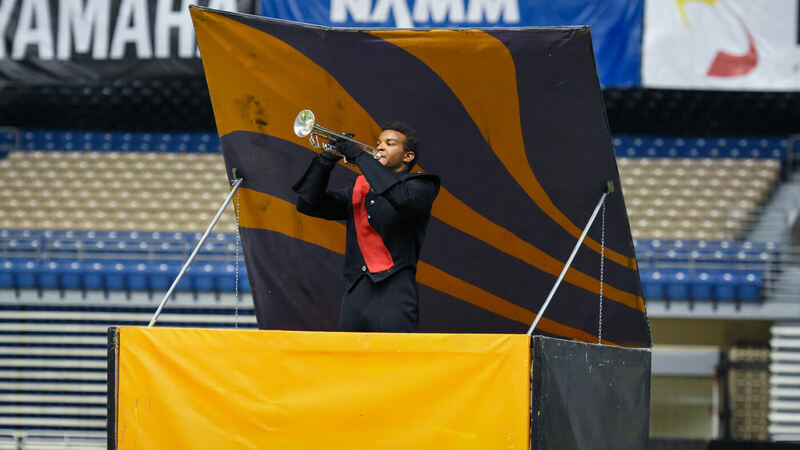 With its low-cost and low-barrier to entry, Bayou City drum major Nikki Colvin says that SoundSport is the perfect performance outlet for her organization. A Bayou City Blues percussionist keeps the team on beat. The team’s performance featured a small but mighty drum line with one member combining four bass drums for himself to play. “We didn’t have a complete drum line, we only had pieces and parts, so we did what we had to do to pull a percussion section together,” Colvin said. 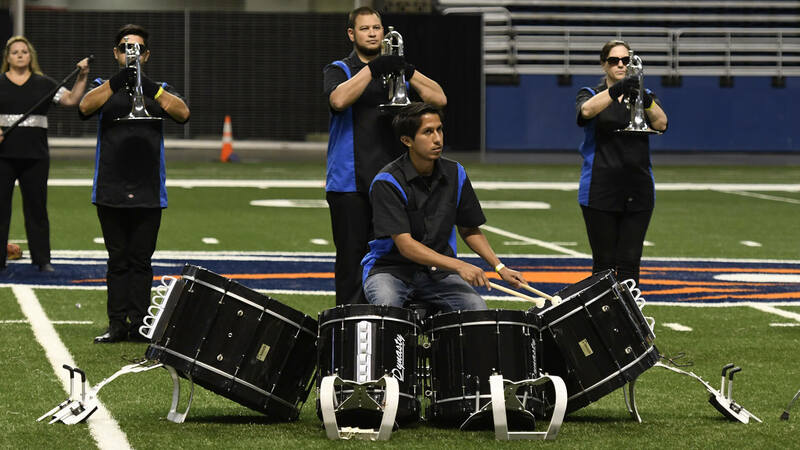 Founded in 2014 as an organization focusing on giving local musicians performance opportunities during the summer, Odessa, Texas' Horizon entertained the Alamodome audience for the first time under a new name on Saturday. Horizon’s performance featured two "out-of-the-box" solos, with members rising from the top of a large handmade prop. The show earned the group a Gold rating and “Best of Show” honors. 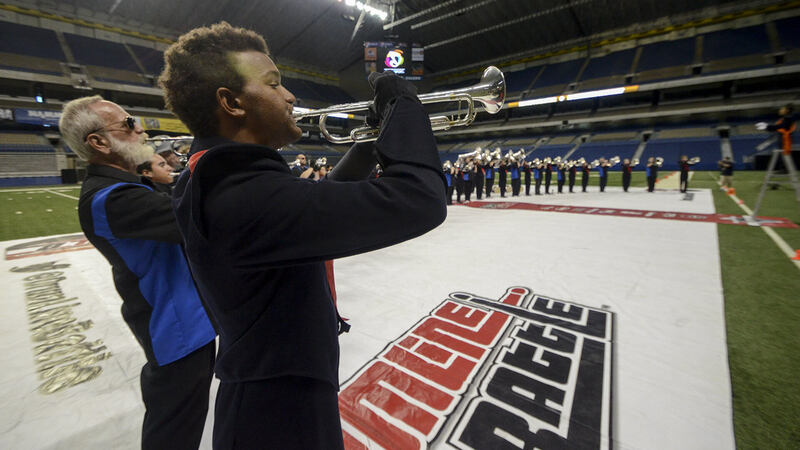 A Horizon member performs at the Alamodome. Vasquez said she believes the team has potential to turn into an Open Class corps in the near future. “With the staff we have now I think we are going to not only grow in numbers with members, but also with volunteers, and I’m sure in the next year or two we’ll be out there in Open Class,” Vasquez said. Members of Bayou City Blues and Horizon aim to see future growth both in their individual teams and the SoundSport activity as a whole. The summer SoundSport season continues with a huge event coming up in Atlanta on Saturday July 30 at the Georgia Dome. Performing teams include Appalachian Sound Drum & Bugle Corps (Ackworth, GA), IMPACT Drum & Bugle Corps (New Smyrna Beach, FL), Les Titans de Quebec (Canada), Florida Xpress (Hawthorne, FL), Sonus Brass Theater (Woodbridge, VA), The Rocketeers (Huntsville, AL), Columbus Saints (Columbus, OH). That Atlanta event will setup a return to Indianapolis for the brand new SoundSport International Music and Food Festival on Saturday, August 13.